Polar bears can be encountered in wide-ranging areas of the Arctic, particularly in Svalbard; East, North and Northwest Greenland; the Canadian Arctic; Russian Arctic; and the north coast of Alaska. Although most polar bears are born on land, they spend most of their lives on the sea ice. Here they hunt for their preferred food of seals from the edge of the sea ice, often living off fat reserves when no sea ice is present. It is a violation of Svalbard’s Environmental Protection Act’s general principle of protection to disturb polar bears. According to the Act “All species of flora and fauna, including their eggs, nests and lairs, are protected …” and “all access and passage in Svalbard shall take place in a way that does not harm […] or in any other way […] result in unnecessary disturbance of animals.” (Section 25 and 73 of Act of 15 June 2001 No.79 Relating to the Protection of the Environment in Svalbard). In Section 30 of the Svalbard Environmental Protection Act it is stated that: “It is prohibited to lure, pursue or otherwise seek out polar bears in such a way as to disturb them or expose either bears or humans to danger.” (Act of 15 June 2001 No.79 Relating to the Protection of the Environment in Svalbard). In other regions of the Arctic national and local regulations may include different provisions. Always check and abide by the legal requirements in the area you are visiting. Always be vigilant for bears when in “bear country”. Always have a plan and be ready to act to avoid encounters by implementing safety measures beforehand. Do not pursue, follow or lure polar bears. Do not seek out polar bears in such a way as to disturb them or expose bears or humans to danger. Never feed or leave anything edible where it can be found by bears. Always keep your distance to ensure the polar bears are undisturbed. If a polar bear is in sight, observe the animal’s behavior and be prepared to retreat or act on short notice. 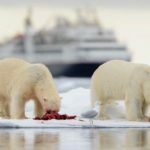 Never approach polar bears closer than 200 meters with an expedition cruise vessel. Small vessel and vessels with low outside decks must never allow a bear to approach the broadside. If observing polar bears from Zodiacs/small boats, these vessels must always be positioned so that the area can be left in a safe and controlled manner should the situation require it. Never follow or approach a swimming polar bear, from any angle. If you catch sight of a swimming polar bear, retreat immediately. If you are planning shore excursions, check out the terrain before landing the passengers. Do not make a landing if you cannot see clearly; for example, if you have low visibility due to fog. Do reconnaissance and look out for polar bears before any passenger comes ashore. Guides carrying firearms and other bear deterrents must lead the group. Establish a polar bear watch system and stay in places where you have good visibility of the surrounding area. If you find a dead polar bear, report it to local authorities in accordance with regulations and local requirements. Beware and take care of the polar bear! The polar bear is the world’s largest predator and it is dangerous to humans. Above all you should avoid confrontations with bears. In areas with polar bears, encounters must be expected anywhere, anytime. Polar bears are best observed from a distance, when they are undisturbed. Hurting or killing a polar bear is an offence if not done in self-defense. Irresponsible actions leading to such a situation can also be deemed an offence. As a rule of thumb, a polar bear’s behavior should not be altered because of your presence. All guides and polar bear guards should be experienced in the safe handling of firearms, have good shooting skills, and have knowledge about polar bear behavior. Unless the user is familiar with the firearm and has had sufficient training with a firearm, the sense of safety provided is deceptive. Appropriate means of frightening and chasing off polar bears should be part of the equipment; for example, flare guns and flare pens equipped with thunder flashes or signal cartridges, sirens and similar. Such equipment should be carried so that it is readily accessible. Because of their dependence on the sea ice, polar bears are classified as marine mammals. The polar bear is listed as a vulnerable species by the International Union for Conservation of Nature but is still hunted in North America and Greenland (in the regions under Russian and Norwegian jurisdiction all hunting is banned). 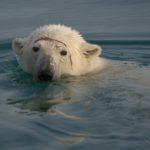 As a species, polar bears have evolved many characteristics that make them especially adapted for cold temperatures, hunting seals and for moving fast across snow, ice and open water. Polar bears have a well-developed sense of smell and are excellent swimmers that can swim long distances. They are at the top of the marine food chain and feed almost exclusively on seals with a very few regional exceptions. A bear can survive up to eight months without eating. 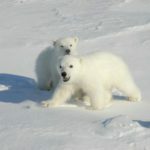 Pregnant female polar bears dig a snow den in early winter, give birth to cubs usually weighing 500-600 grams in late December, and emerge with cubs weighing 8-10 kg three-to-four months later. During this time, they live off their fat reserves. Males are larger than females, and can weigh 400-600 kg. Adult females typically weigh 150-250 kg depending on the season, geographic area and general condition. Watching undisturbed wildlife in its natural environment is an unparalleled experience. To avoid disturbance when encountering polar bears, you are asked to be considerate and follow these wildlife guidelines.